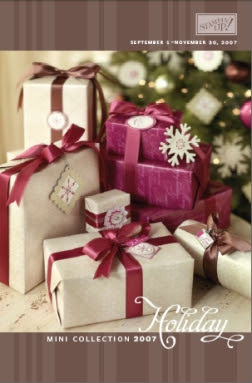 Craftin' Caro: Holiday Mini Catalogue is HERE! My downline, Lynn Put, e-mailed me a link to your blog. Thanks for the compliments on my swap. Love the "tufts of hair", adds a little more whimsy to "Mr. Grumps". I actually swapped 3 different designs and this was the most popular. It was a lot of fun swapping it, met lots of great people. Have a great time at Founder's, I'm sure you worked very hard to get there!!! Love your blog, bookmarked in my favorites. I hope to be blogging soon myself! !